« Howdy Pardner! It’s Stick ‘Em Up Friday for December 16th ~ List All Your Giveaways Here! Are you one of those people who are fascinated by facts? I am and fortunately, so is my husband. When I was a kid, I LOVED reading The World Almanac and could pore through that book for weeks, completely enthralled by everything I learned. I reviewed The World Almanac and Book of Facts 2012, which retails for $12.99, but is currently on sale for $8.25 with FREE SHIPPING. Which 2012 election candidate plans to lower the presidential salary to less than $40,000? How many millions of smartphones were sold in the United States over the past year? Which U.S. state has the highest public high school graduation rate? Find the answers to these questions and more in The World Almanac and Book of Facts 2012. Gracing the cover of this year's edition is singer Adele, whose 2011 album "21" broke the record for most consecutive weeks in the Top 5 of the Billboard 200. Adele is joined by NY Yankees veteran shortstop Derek Jeter, who this year became the historic franchise's all-time hits leader, surpassing Hall-of-Famers Mickey Mantle, Babe Ruth and Lou Gehrig. The World Almanac and Book of Facts 2012 also boasts a new feature on "Greatest Sports Upsets", inspired by Japan's unexpected victory in the Women's World Cup and the underdog Dallas Mavericks' six-game win against the Miami Heat in the NBA Finals, the editors have compiled a list of the most surprising athletic outcomes of all time. Speaking of fierce competitions, The World Almanac previews the 2012 election, with biographical and financial profiles of all serious contenders, as well as other key issues and facts. "The Changing United States", a brand-new graphic feature, highlights the most fascinating aspects of the country's changing population based on newly released 2010 census data, with bonus statistics on how Americans get to work, get paid, and manage their time. "Year in Review" recaps the top headlines, strangest news stories, and most striking images of 2011. After 140-plus years, The World Almanac still ranks as the best-selling American reference book, with 82 million copies sold. So, if you're looking for the perfect stocking stuffer for the Cliff Claven on your list, then by all means, give them The World Almanac and Book of Facts 2012. I promise that if your gift recipient is anything like my husband or me, your loved one will read this book cover to cover throughout all of 2012! 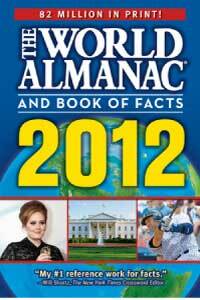 Disclosure: I received The World Almanac and Book of Facts 2012 in order to facilitate my review. No other compensation was received. This product review is based on my own personal experiences with this item and is completely honest and objective.